An AV-8B Harrier assigned to Marine Medium Tiltrotor Squadron (VMM) 162 (Reinforced), 26th Marine Expeditionary Unit (26th MEU), launches from the amphibious assault ship USS Kearsarge (LHD 3) to conduct their first missions over Iraq in support of Operation Inherent Resolve. Kearsarge is deployed to the U.S. 5th Fleet, supporting Operation Inherent Resolve, the effort to degrade and ultimately destroy ISIL; maritime security operations; and regional theater security cooperation efforts. 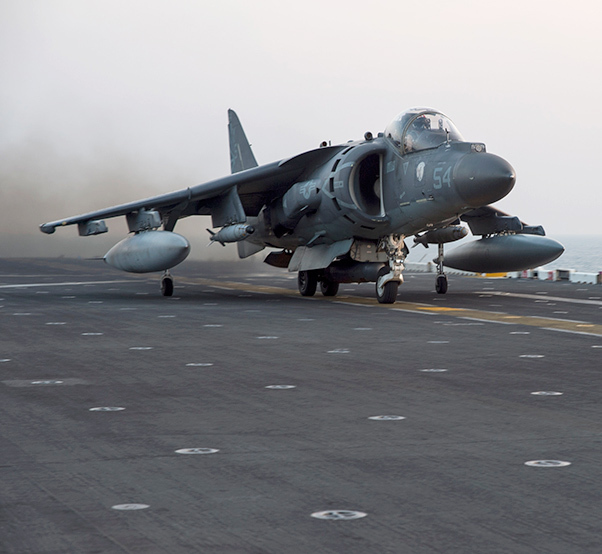 Naval Aviation rejoined the fight against ISIL Nov. 19 when AV-8B Harriers from Marine Medium Tiltrotor Squadron (VMM)162(Reinforced)launched from the amphibious assault ship USS Kearsarge (LHD 3) to conduct their first missions over Iraq in support of Operation Inherent Resolve. The last Naval Aviation missions in support of OIR were Oct. 17, from USS Essex (LHD 2). VMM-162(REIN) is the aviation combat element of the 26th MEU, currently embarked with the Kearsarge ARG. Capt. 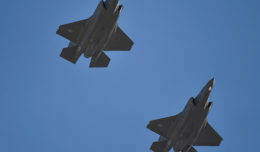 Augustus P. Bennett, commander, Kearsarge Amphibious Ready Group (ARG), said the Sailors and Marines under his charge are prepared for what lies ahead. 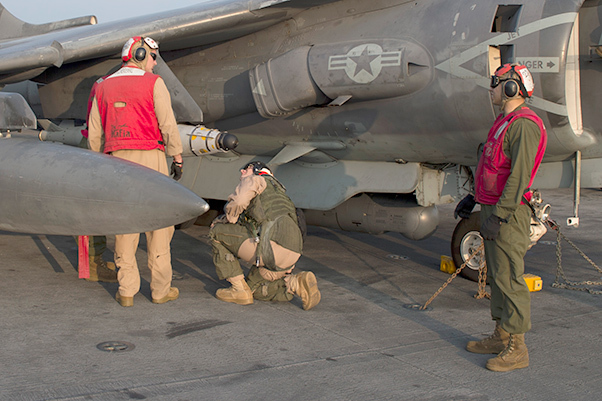 Marines, attached to the 26th Marine Expeditionary Unit (MEU), perform last minute checks of an AV-8B Harrier assigned to Marine Medium Tiltrotor Squadron (VMM) 162 (Reinforced) before launching from the amphibious assault ship USS Kearsarge (LHD 3) to conduct their first missions over Iraq in support of Operation Inherent Resolve. Kearsarge is deployed to the U.S. 5th Fleet, supporting Operation Inherent Resolve, the effort to degrade and ultimately destroy ISIL; maritime security operations; and regional theater security cooperation efforts. 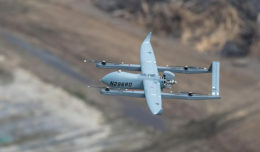 In addition to Naval Aviation missions against ISIL in support of OIR, the Marines and Sailors of the ARG-MEU team are deployed throughout the region conducting various missions including theater security cooperation and maritime security operations. The Kearsarge ARG arrived in the U.S. 5th Fleet Nov. 1. 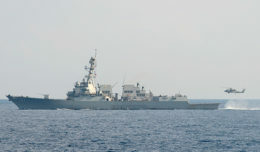 The U.S. 5th Fleet’s area of operations encompasses about 2.5 million square miles of the Middle East’s maritime reaches and includes the Arabian Gulf, Red Sea, Gulf of Oman, Gulf of Aden, Arabian Sea and parts of the Indian Ocean. Available to watch on YouTube here and here – Ed.